The versatile EZOPower desktop space-saving charging station is the perfect solution for charging 6 devices simultaneously via 3 AC sockets and 3 USB ports. Unique design allows charging multiple devices at a single location to avoid clutter and keep desktop, nightstands, or counter top clear. Slot holder designed for hands-free viewing while charging. LED indicators ensure that your devices are grounded and protected while charging. This charging station is ideal for home, office or a professional workstation, you now have additional power with added security of surge protection. Specifications: -Charge devices simultaneously through three available AC outlets -Extra USB ports provides three additional charging options -Input - 120VAC / 12A / 60Hz -Output - 120VAC / 12A / 60Hz / 1440W (Total) -3 USB ports: 2.1A(Total) / 5Vdc -Built-in slot holder: Length: 5.25inch / Width: .75inch -Grounded and protected light indicators -5.50ft three prong power cord -Dimensions: 5.00in x 5.00in x 1.25in -Voltage Protection Rating: L-N 400V, L-G 4000V, N-G 400V -UL safety standard certified. Compatibility: Cellphones, Smartphones, Tablets, eBook Readers, portable gaming systems, nintendo switch, laptops or ultrabook pc, lamps, and more. Perfect mother's day gift, father's day gift, birthday gifts, parents, grandparents, siblings, and more. Get rapid fast charging easily. ALL-IN-ONE CHARGING STATION: This desktop charge station with tablet/phone stand provides a versatile charging solution for up to six devices. Charge all your devices at the same time and same location to keep tables, night stands, and dressers clean and clutter-free. The outlet strip eliminates the need for proprietary wall chargers and allows ultra fast charging so your devices are always ready-to-go without noisy fans or endless buzzing. 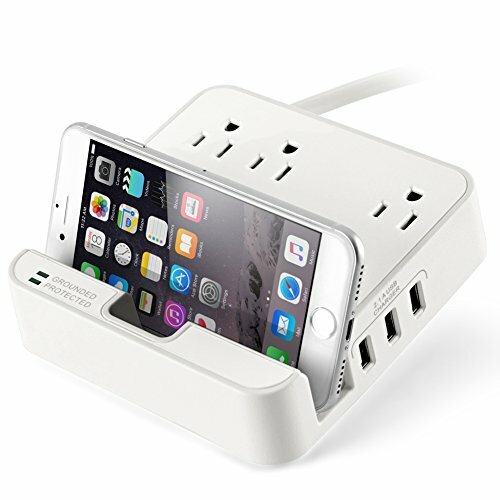 ENDLESS POWER: 3 AC outlets and 3 2.1A / 5V USB ports with 6 Feet Power Strip Cord offer practical and simultaneous charging capability for multiple devices at home, the office, or while traveling. Never again will you need to worry about your smartphone, Powerbank, Bluetooth headphones, portable speakers, tablet PC, laptops, ultrabooks digital camera chargers and more running out of power. Easily share power and outlets with coworkers, classmates, or family. SAFETY AND STABILITY: Surge protected AC outlets with X3 MOV Chip Technology and fire-proof ceramic encasing. The charging station is FCC, CE, and UL certified to ensure premium safety and quality standards. Worry-free multiple levels of protection against overcharging, surges, and overheating. Built-in surge protection with LED indicator for peace of mind and safety assurance. UNIVERSAL COMPATIBILITY: Compatible with Home Office Electrical Devices and All USB Powered Devices including Apple iPhone 8 / X / 7 / 7 Plus, iPhone 6s / 6s Plus, iPad Air / Pro, Microsoft Surface Pro Tablet, Samsung Galaxy Tab A / Galaxy Tab S3, galaxy Note 8, Galaxy S8+, S8, S7, LG G6, G5, G4, V10, G4, K7, Nokia Lumia Series, HTC One, M1, 10, M9, Motorola Moto G Plus, G5 Plus, G5, Moto E, Moto G, Moto X, ASUS ZenPad 3S 10 9.7, Acer, Dell, HP, Lenovo, Sony tablet, Laptop, Smartphone and more.